My tomato plants need to find their resting place. This park was one of our favorite places to go when the kids were little. There was a fountain in the middle and the water was really clear we could see small fishes in the water. The other day I was surprised to see that it is now almost completely covered with tiny little floating plants called duckweeds (Lemna minor). Given the right conditions, duckweeds can be very prolific. One reason for this fast growth in this pond could be high nitrogen content of the water. The sloped surrounding grass area is kept green year round - meaning high amounts of nitrogen is applied on a regular basis. It is expected that some nitrogen find their way to the pond through runoff. A second reason for the high nitrogen content of the water could be due to the animal waste from all the ducks in area. It appears that the duck population in the area cannot keep up with the growth of the duckweed. I wonder what the Community Service District will do with this pond - to get rid of the duckweed infestation. They could keep it that way or do something to remove it so that the water can be clear again. They could increase the duck population but that will only increase the amount of animal waste going into the water. They could skim the duckweed regularly but that would be labor intensive. Duckweed is rich in nitrogen and would make an excellent composting material; local gardeners can be encouraged to do their part and harvest some of the duckweeds. 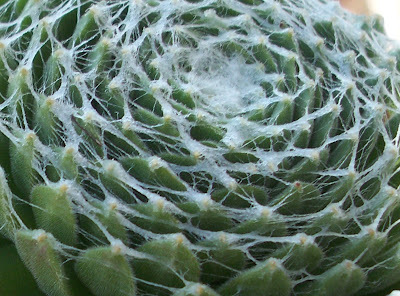 The Sempervivum arachnoideum is very unique succulent in that it has the appearance of an organized entanglement. If you are not familiar with this plant you might get the impression that they are infested with spiders. On the contrary, those webby structures on the leaves could be a defense mechanism against insects. Trichomes loosely connect leaves together. The white webs on the leaves are specialized trichomes that connect the leaves together. As seen from the picture above, there are normal trichomes (hairs) on the surface of the leaves but those that form the webs are coming mainly from the pointy tip and margins of the leaves. These spiderweb-like trichomes stretch as the leaves grow. That is why they are increasingly longer and sparse on the periphery of the rosette. The growth of the trichomes starts with the growth of the leaves as indicated by the concentration of very tight webs in the middle. Trichomes are "leaf hairs". They come in different forms and in some cases there are different types of trichomes in one leaf as exemplified by the Sempervivum arachnoideum. (Just like in humans and animals - the hair that grows on the head is different from those that grow on the arms, so is in plants.) They have different functions depending on the nature or habitat of the plants. Trichomes can serve as a deterrent to insects. Also they can serve as defensive layer against extreme environmental conditions such as wind, heat, cold, ultraviolet rays. In some cases trichomes also serve as a mechanism for salt tolerance. Webby trichomes make the plants look frosty. Sempervivum arachnoideum is a type of succulent that originated from the Alps (1) and I believe that their trichomes play an important role in its ability to adapt in the snowy, windy and cold conditions of the Alpine Mountains. It is an evergreen plant and can tolerate freezing temperatures. Although they do well in dry conditions, adequate water helps the tiny plants to grow at a faster rate. Pink flowers float from the multitudes of Sempervivum aracnoideum rosettes. As of this week, spikes are coming out from the Cymbidium California 'Sun Acres'. Compared to last year's bloom, these flowers are coming out early. Considering that we just got into fall season not that long ago, this is indeed a pleasant surprise. Last year I learned that flower initiation in cymbidiums is greatly affected by the differential temperatures (maximum and minimum) of the day. They require between 10-20 degrees (F) difference between the day and night time temperatures before flower initiation depending on variety. Out of the five different cymbidiums I repotted last spring, only this variety is flowering so far. However, all of them are looking very healthy which indicates that they are all set to put on their own show and just waiting for the opportune moment. I intended to pursue cymbidium as my new hobby plant for this year. My plan was to buy at least 100 plantlets for a start. My husband, who is always very supportive, already purchased all the pots that I would use for this purpose. These pots, which are still in a huge box, haunt me every time I see them in the garage. And yet, here I am still vacillating as to whether it is a good idea or not. Gardening is a time-sensitive endeavor. A delay in implementation moves the reward further away. Botanical meaning: enlargement of the ovary into a fruit without fertilization. Parthenocarpy is the phenomenon behind most seedless fruits. Parthenocarpy is fruiting without the union of a male and a female egg cell. The lack of fertilization means that there are no seeds in the fruit. If there are seeds, they are not viable and are not capable of germinating. Many times we take seedless fruits for granted and even despise the ones with seeds. Although it is a natural occurrence in some varieties of some plant species (such as banana, persimmon, pineapple, and orange) parthenocarpy is an "abnormal" condition. I say this because technically fruits are supposed to have seeds. Seed is the reason for the fruit. Seedless grapes with traces of undeveloped seeds. Fruit development begins with pollination. The moment the right pollen grain touches the stigma (the sticky surface of the pistil), fireworks of events happen as if a switch button has just been set to ON. First a pollen tube develops as a passage way for the sperm nuclei in the pollen to the reach the ovules (part of the flower that develops into a seed). As soon as the pollen reaches its destination fertilization occurs and a zygote (fertilized egg = seed) is developed. Then several hormonal changes happen to signal a succession of events that support a continued development of the zygote. Gibberellin level suddenly rises resulting in the enlargement of the tissue surrounding the ovary. This tissue eventually differentiates to form the fruit. Fruits tissues come in different charactreristics: fleshy (as in grapes, peaches and apples), hard (as in nuts) or dry (as in dandelions and grains). In short, fruit development occurs when a seed starts to develop. 1. Uncompleted Seed (Aborted Embryo). Pollination triggers fruit development but in some cases the embryo is aborted before successfully developing into a seed. The landing of pollen on the stigma is enough to trigger fruit formation that continues regardless of failed seed development. Seedlessness through parthenocarpy does not involve fertilization. However, seedlessness can still happen even after fertilization has already occurred through stenospermocarpy. In this mechanism, the embryo is aborted just the same but at a much later time (1). The 'Thompson' and 'Flame' seedless grapes are examples of stenospermocarpy; traces of undeveloped seeds are visible when the berries are opened (see picture above). 2. Genetic Disorder (Chromosome Imbalance). Plant species which are triploids cannot successfully produce seeds - they are genetically sterile. The banana we buy from the grocery store is parthenocarpic because it is a sterile triploid (two sets of chromosomes from one parent and one set from the other) instead of the normal diploid where you get one set of chromosomes from each parent. Pollination happens but fertilization does not. The tiny black dots inside the banana are traces of the unfertilized ovules. In the case of seedless watermelon, triploidy is induced through genetic manipulation. 3. Absence of a Perfect Mate (Self-Incompatibility). Some plants species are self-incompatible - they are self sterile when pollinated by the same variety of plant. In order to fruit, these species require pollens from a plant of different genetic makeup. Navel oranges, pineapples, and clementines are examples of self -incompatible plants. For example, when an orchard of the same variety of oranges is grown, fruits would come out seedless (parthenocarpic). 4. Manipulation by Steroids (Application of Growth-Regulators). There are several growth hormones that play a role in parthenocarpy but for the current topic, our focus will be gibberellin. Gibberellin is a phytohormone (plant produced-hormone) that is also produced by certain fungus called Gibberella fujikuroi. Through this fungus, gibberellin-like compounds known as gibberellic acid (GA) can be produced apart from the plant. GA is known to promote cell division and enlargement; when applied to plant at a strategic time and rate, the plant will respond accordingly. This knowledge regarding the response of plants to applied GA and the knowledge that endogenous (produced within) gibberellin levels in plants increase upon fertilization and thus triggering fruit development have changed the horticulture industry. Flowers can now be fooled into thinking that fertilization has taken place and thereby developing fruit-tissues. In other words, fruits can be induced with the application of gibberellic acid. Parthenocarpy is a delightful abnormality because the seedless fruit maintains the appearance and taste of its normal counterpart. This is the reason why growers have capitalized on it to improve the commercial value of some crops. Research work continues to exploit the application of parthenocarpy on more plant species where the seed is not for consumption. One of the noxious weeds that I see everyday when I walk my child to school is the Yellow Starthistle. The flowers may look innocent but the Yellow Starthisle is registered in the list of noxious weeds in California. Its aggressive spread affects the yield and quality of rangelands, pastures and grasslands. The spines on the flowers make it less palatable to livestock; hence they avoid areas that are infested with the weed. In this case the spread of Yellow Starthistle does not affect livestock per se but it reduces the effective grazing area. For the horses, however, this weed is food. Horses eat this weed and they are capable of chewing and digesting it. When a horse consumes a certain amount of this toxic weed, it can contract a neurological disorder called "chewing diseases" (Nigropallidal encephalomalacia). Inability to swallow and chewing in the absence of food in the mouth are among the symptoms of the disease. This weed is wanted in California! You and I are licensed to kill it. If you are looking for an opportunity to have no mercy on a plant - this is it! Have you ever seen fig flowers? If you are thinking of colorful petals then it is certain that you would not have recognized the flower even if you saw one. However, if you have already opened a fig fruit it is likely that you also have seen fig flowers. Fig flowers are hidden. Hundreds of tiny flowers line the inner wall of a hallow receptacle. In the natural process of fruiting, cells around the ovary enlarge and divide soon after the ovules have been fertilized. This growth of cells results from a natural production of the necessary plant hormones (such as gibberellin and auxin) which is triggered by the fertilization of the ovules (except in the case of parthenocapic fruits). The fruit generally functions as attractant to organisms that would be agent to seed dispersal. In the case of figs, the receptacle enlarges around the seeds - forming a sweet and fleshy bulbous-shape fruit. Inverted fruit. An ordinary plant flower is colorful and very conspicuous attracting a wide variety of pollinators. The flower is like the flag being waved to indicate that this flower welcomes visitors. The fig inflorescence is the opposite of the normal flower because they are hidden inside a syconium (from the Greek word sykon meaning fig). Syconium is an inverted fruit and the fig is a syconium. A carpet of numerous small flowers is concealed inside with only a tiny aperture called osteole on the outer end of the fruit. Pollination Extraordinaire. With the enclosed flowers of this tree, pollination is hardly imaginable. However, through the mystery of a mutualistic symbiosis between the fig tree and the fig wasp, pollination takes place in a most unusual way. The flowers inside the syconium exude a subtle hint of perfume that serves as a signal for the wasps to get in at the right time. Of all the insect species, only the fig wasp is known to pollinate the fig tree. Likewise, of all the fruits known to these wasps, only the fig qualifies to hold their eggs. The fig tree and the fig wasp cannot live without the other. Truly, this interesting phenomenon in plant-insect relationship cannot be explained easily without attributing it to God's design. Cross section of a syconium showing numerous achenes. Figs - delicious and nutritious fruits.